Deadbolt locks are a great security feature for homeowners and businesses. Locksmith Bee has been installing and repairing deadbolt locks locally for almost a decade. 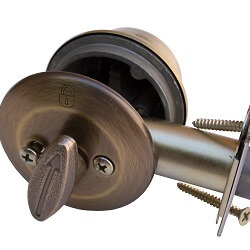 A deadbolt lock has a steel bolt that goes into a strike plate on the door frame when locked. A dead bolt, or dead lock as it is also commonly known is a locking mechanism distinct from a spring bolt lock because a deadbolt cannot be moved to the open position except by rotating the lock cylinder with the proper key. It is imperative that a deadbolt lock be installed correctly for it to offer maximum security. Deadbolts offer consistent protection and security for residential and commercial properties. Our high-tech equipment is cutting edge and our technicians have up-to-date knowledge on the latest techniques. You can rest assured that our skilled technicians will install your new deadbolt locks correctly and fix any issues with your current deadbolt locks. You will be further assured to know that our services are guaranteed. We have a great reputation for quality work and we maintain that reputation by providing affordable, excellent solutions.